Bullous pemphigoid (BP) is an acquired autoimmune disease that affects mainly the elderly people and is characterized by subepidermal blistering. The incidence is between 0.2 and 3 per 100,000 person years. 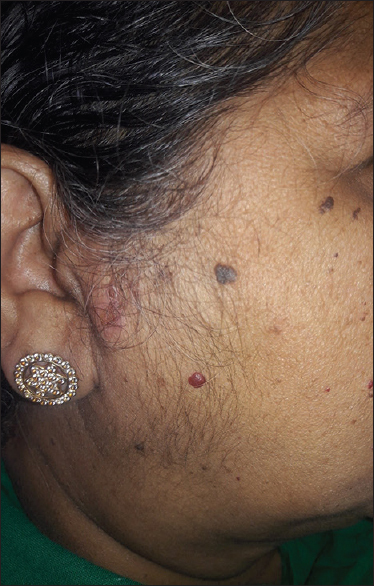 Pemphigus vulgaris (PV) is more commonly encountered than BP in India. It affects elderly individuals in the fifth to seventh decade of life, with an average age of onset being 65 years. BP in childhood has been reported from various countries including India. There is no known ethnic, racial, or sexual predilection. Although in most cases the causative agent remains unidentified, certain medications have been implicated in the pathogenesis of the disease. The drug-induced variant of BP follows the oral or (sometimes) topical administration of specific drugs. It is difficult to differentiate clinically from classic BP and must always be considered as a possible diagnosis in elderly patients who have recently changed or added a new drug in their normal medication regimen. 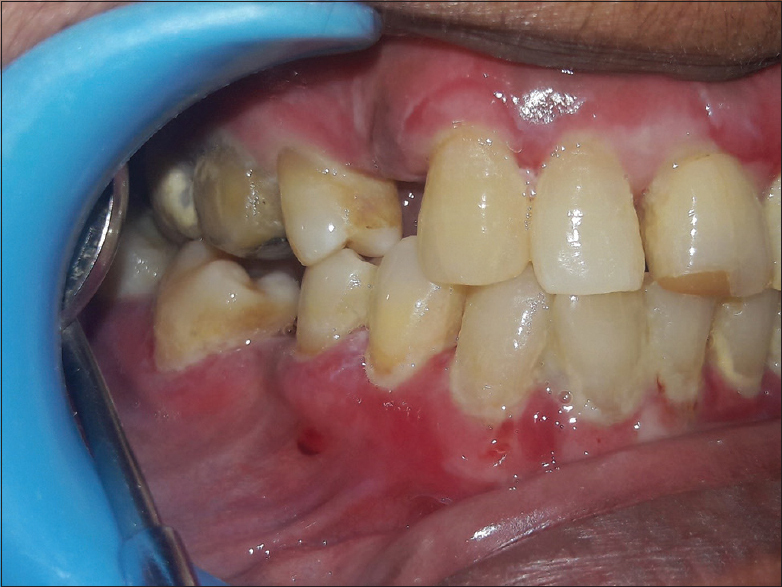 A 63-year-old female patient reported to the Department of Oral Medicine and Radiology, with chief complaint of pain and bleeding gums since 5 months. She also complained of burning sensation to hot and spicy food. She had noticed blisters on mouth, scalp, face, shoulder, hands, and feet which were ruptured and formed ulcers since 5 days. Medical history revealed that she is a known diabetic for which she is taking a drug (vildagliptin) since 5 months along with insulin. Personal history and family history were noncontributory. On general physical examination, all vital signs were within the normal limits. Extraoral examination of the head and neck revealed erythematous areas on the right and left shoulder, preauricular area, flexor surface of legs, arms, and on the scalp [Figure 1]. 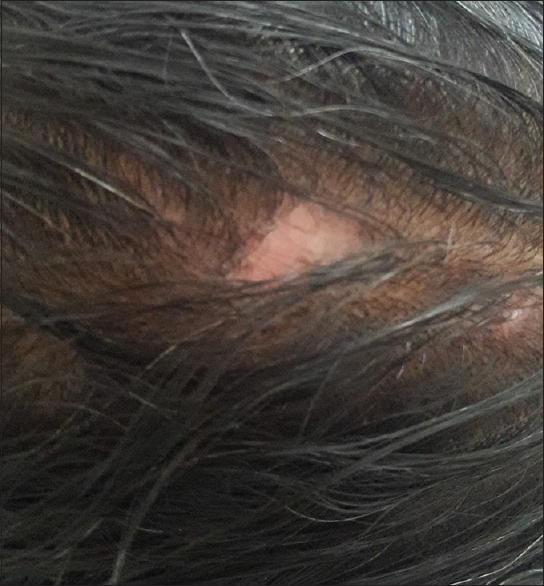 Ruptured blister with alopecia was noted on the scalp [Figure 2]. Multiple ulcers were present on trunk back [Figure 3], shoulder, arms, and legs. Recently, ruptured vesicles on back and extremities showed serum discharge. 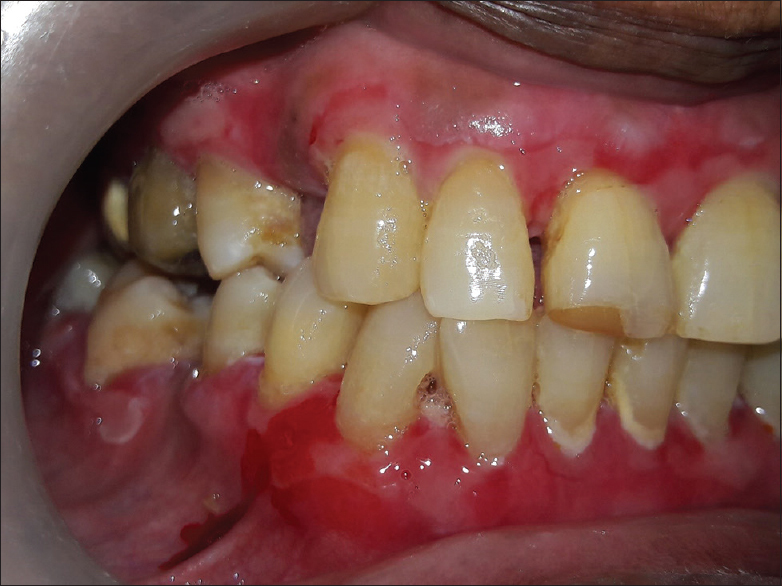 Intraoral examination revealed fluid-filled blisters and desquamation of gingiva with erosive areas involving interdental papilla, marginal gingiva, and attached gingiva [Figure 4]. 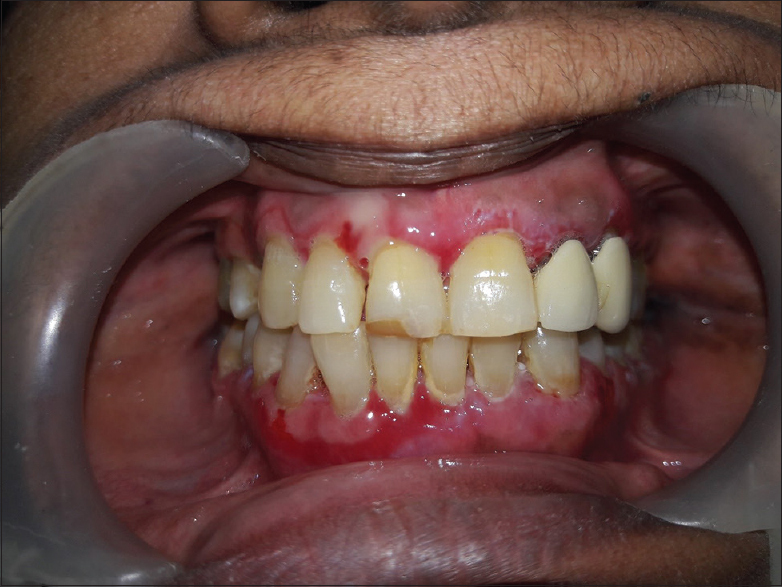 Bleeding from marginal gingiva was noted [Figure 5]. In upper gingiva, linear erythematous area with superficial necrotic slough and in lower gingiva diffuse swollen erythematous area with central ulceration were noted. Other parts of oral cavity were free from ulceration. 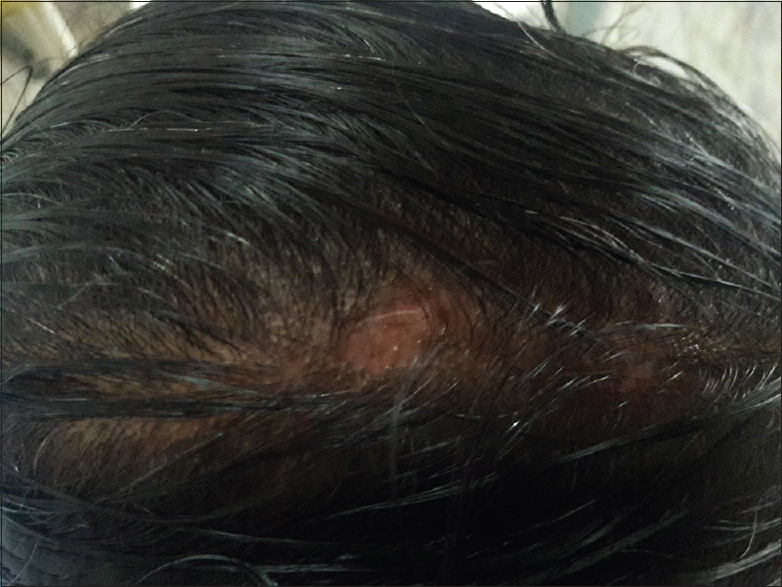 Hence, on the basis of history and clinical examination, a provisional diagnosis of PV was given with a differential diagnosis of drug-induced BP, erosive lichen planus, chronic desquamative gingivitis, and cicatricial pemphigoid. Incisional biopsy was done including perilesional area from gingiva. Histopathological report came as BP. 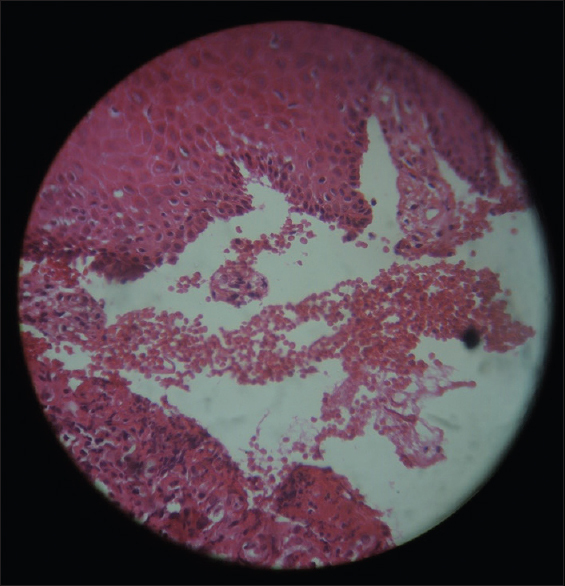 The given hematoxylin and eosin–stained soft tissue section showed parakeratinized stratified squamous epithelium with subepithelial split. Basal cells were intact with surface epithelium. Areas of subepithelial inflammatory cell infiltrate were seen particularly lymphocytes. Connective tissue showed bundles of collagen fibers with vascular channels and areas of extravasated RBCs [Figure 6]. Direct immunofluorescence (DIF) was done for a confirmatory diagnosis. DIF features were favoring BP. Management was done by giving 20 mg of tab prednisolone twice daily for 1 week, and subsequently the dose was reduced to 10 mg twice daily for the next 2 weeks. Oral lesion was managed with tab betamethasone 0.5 mg for swish and spit once daily. For dermal lesions, we prescribed ointment Clonate-F cream (clobetasol and fusidic acid topical) to be applied twice daily along with discontinuation of vildagliptin. Her blood sugar level was under normal range which was managed by insulin. Systemic steroids were tapered and discontinued after 3 weeks. For oral and dermal lesion, tab betamethasone and Clonate-F cream were continued. After 1 month of medication, the extraoral lesions were healed and intraoral ulcerations subsided [Figure 7], [Figure 8], [Figure 9], [Figure 10]. BP, which is the most common of the subepithelial blistering diseases, occurs chiefly in adults older than 60 years of age. It is self-limited and may last from a few months to 5 years. BP may be a cause of death in older debilitated individuals. The precipitating factors include ultraviolet (UV) light, either UVB or psoralen with ultraviolet A (PUVA), radiation therapy, percutaneous endoscopic gastrostomy, thermal burn, amputation stump, incisional hernia scar, injection, or an adhesive dressing. BP has also been reported in association with other autoimmune diseases such as diabetes mellitus and pernicious anemia, chronic inflammatory skin diseases such as lichen planus and psoriasis, and various malignancies. Since drug-induced BP was first reported in 1970 in an 11-year-old boy receiving salicylazosulphapyridine, multiple drugs have been implicated in the pathogenesis of the disease. Medications that have been associated with BP-like disease include furosemide, NSAIDs (ibuprofen), antidiabetics like vildagliptin, sitagliptin, and tolbutamide, captopril, phenacetin, penicillamine, etarnacept, and systemic antibiotics. Tibolone (a selective tissue estrogenic activity regulator that has progestogenic, some androgenic and estrogenic effects) induced BP. Lesions usually appear as tense bullae on normally appearing skin, or (more uncommonly) on an erythematous or even urticarial base. They may be accompanied by erythema multiforme type of lesions such as target lesions on palms and soles. Nikolsky sign can be positive in some cases., It chiefly involves the scalp, abdomen, extremities, axilla, and groin. Patients with BP may experience one episode or recurrent bouts of lesions. The bullae are usually filled with clear fluid but may be hemorrhagic. There is rarely oral and ocular mucosal involvement. The bullae usually heal with postinflammatory pigmentary changes, and there is no scarring or milia formation. BP of childhood is rare. The age of onset in childhood BP varied from 2.5 months to 14 years. Childhood BP often follows a benign course, with disease duration of <1 year. Oral involvement can be seen in 10%–20% of patients with BP. The oral lesions of BP are smaller, form more slowly, and are less painful than those seen in PV; the often extensive labial involvement seen in PV is not present. 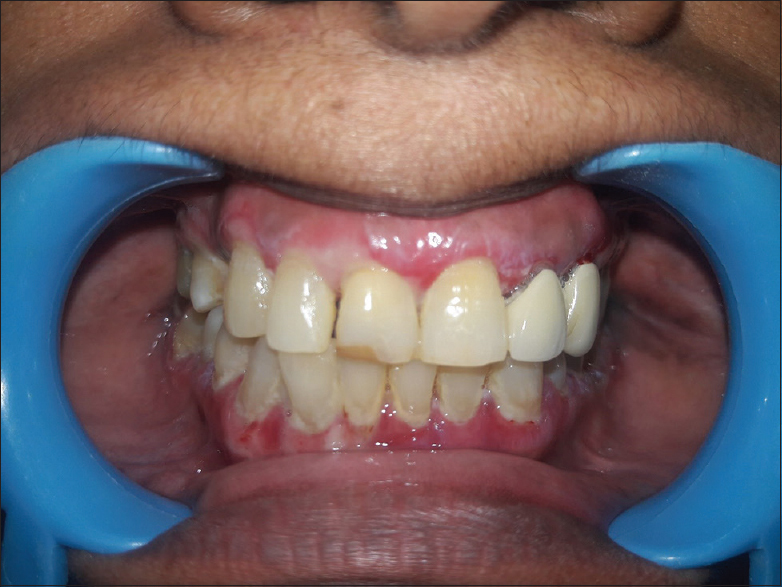 Desquamative gingivitis has also been reported as the most common oral manifestation of BP, and the gingival lesions may be the only site of oral involvement. The gingival lesions consist of generalized edema, inflammation, and desquamation with localized areas of discrete vesicle formation. Differential diagnosis includes erosive form of lichen planus, PV, and other subepithelial bullous dermatoses. The erosive and ulcerative forms of lichen planus frequently exhibit white Wickham striae at the periphery along with ulcerations and erosions. PV usually has more extensive erosion of mucosa and skin involvement. The other subepithelial bullous dermatoses appear clinically similar to BP and can only be distinguished by immunofluorescent and molecular techniques. Routine histology of a biopsy specimen demonstrates separation of the epithelium from the connective tissue at the basement membrane zone and an inflammatory infiltrate that is usually rich in eosinophils, particularly in skin biopsies. DIF study of a biopsy specimen taken from perilesional inflamed tissue demonstrates deposition of IgG and C3 bound in a linear band to the basement membrane [Figure 11]. 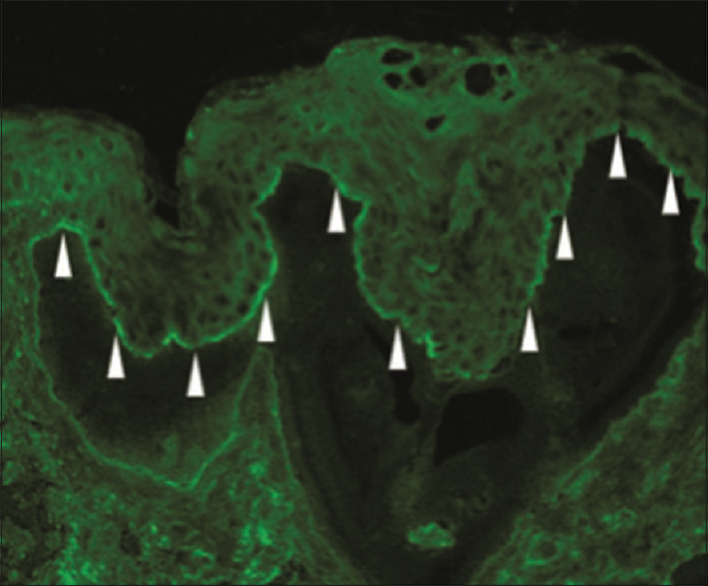 Indirect immunoflourescence study of serum obtained from patients with BP demonstrates IgG antibodies bound to the epidermal aspect using the salt-split skin technique. The salt-split skin test is particularly useful in distinguishing BP from cicatricial pemphigoid and epidermolysis bullosa acquisita that has IgG antibodies localized to the dermal side of the salt-split skin (floor of the blister) [Figure 12]. Direct and indirect immunoelectron microscopy ultrastructurally localizes in vivo-bound IgG autoantibodies to the binding site at the basement membrane. Immunoblotting or Western blotting demonstrates reactivity of IgG in the sera of patients with BP, with proteins extracted from healthy human skin. The sensitivity of immunoblotting varies. Immunoprecipitation also demonstrates reactivity with BP230 and BP180. Unlike immunoblotting, immunoprecipitation is performed with native rather than denatured protein and is more sensitive. Enzyme-linked immunosorbent assay analyzes the BP antigen-specific IgG autoantibodies in the patients' sera using various lengths of recombinant proteins of the BPAg1 or BPAg2 antigens. In everyday clinical practice, the differential diagnosis of drug-induced BP can prove to be quite difficult. The recent history of received medications and the histopathological picture of the disease can set a possible diagnosis. After withdrawal of a suspect medication, most patients respond rapidly to treatment and do not experience relapses of the condition. In the future, as new therapies emerge, the number of drugs thought to cause BP will probably increase. Therefore, more studies are needed to identify those regimens that are more commonly associated with drug-induced BP and those patients who are more prone to develop the condition. StavropoulosPG, Soura E, Antoniou C. Drug-induced pemphigoid: A review of the literature. J Eur Acad Dermatol Venereol 2014;28:1133-40. Glick M. Burket's Oral Medicine. 12th ed; 2015. p. 82-3. Bean SF, Good RA, Windhorst DB. Bullous pemphigoid in an 11-year old boy. Arch Dermatol 1970;102:205-8. 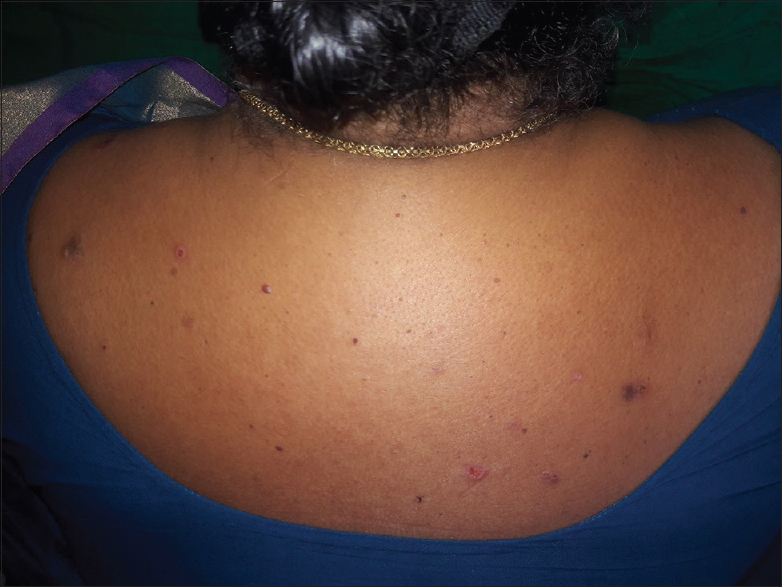 Vassileva S. Drug-induced pemphigoid: Bullous and cicatricial. Clin Dermatol 1998;16:379-87. Soni AG. 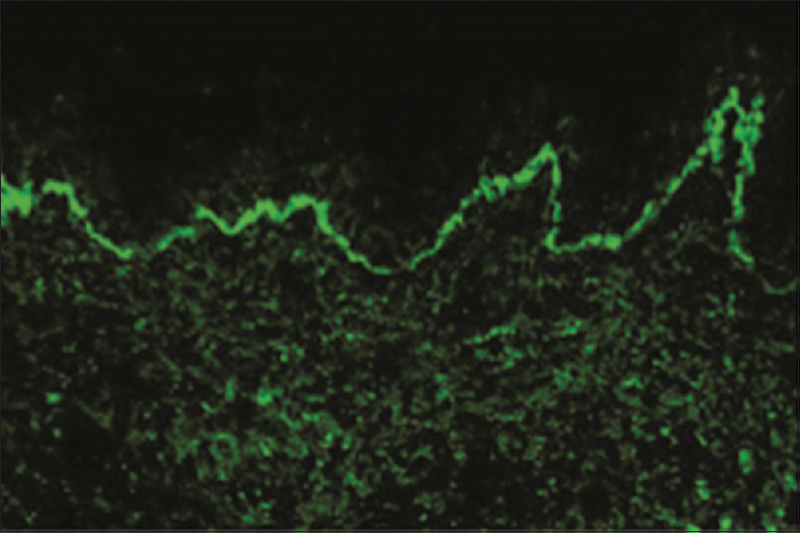 Nikolsky's sign – A clinical method to evaluate damage at epidermal-dermal junction. J Indian Acad Oral Med Radiol 2018;30:68-72. Fontaine J. Treatment of bullous pemphigoid. J Dermatol 2003;30:83-90. Wojnarowska F. Guidelines for the management of bullous pemphigoid. Br J Dermatol 2002;147:214-21.